Valerie Vigoda performs a solo show at the home of Kevin Surace and Erica Rogers in Sunnyvale, on Dec 2, 2016. The violin has a similar range to the female human voice. So when you're doing both at the same time you're using the same neural pathways. Happily, Valerie Vigoda seems to have mastered the technique  her brain must be like a musical broadband. Vigoda is one third of what used to be known as the "piano/violin/drums theatrical power trio" GrooveLily. That band started out as a touring rock act but grew up to write and perform some fabulous musicals, including "Striking 12" and "Sleeping Beauty Wakes," which were big hits at TheatreWorks. 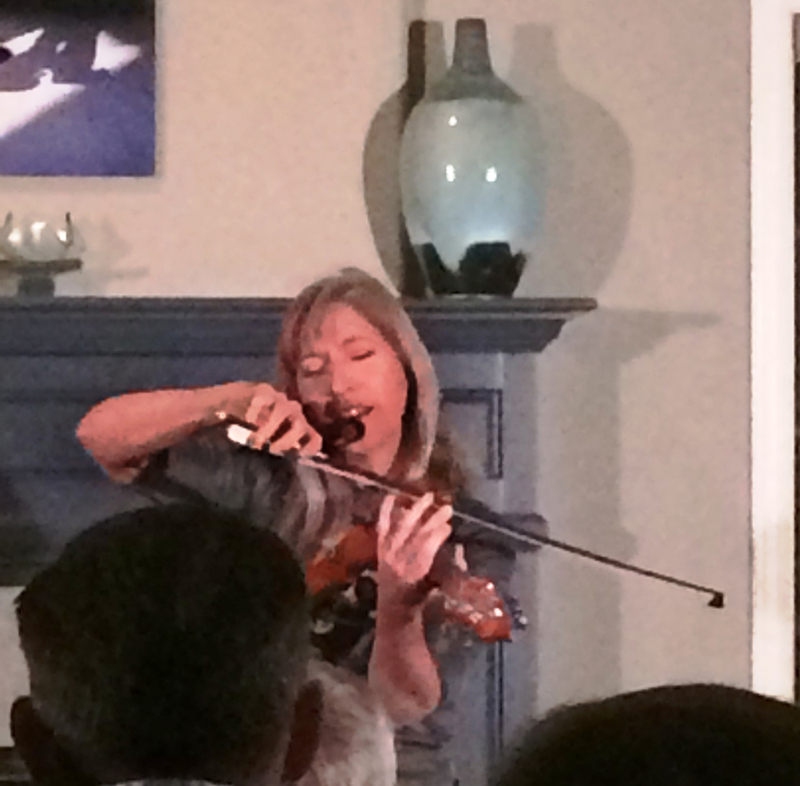 Earlier this month I was lucky enough to catch Vigoda's solo act at a house concert put on by Kevin Surace and Erica Rogers at their Sunnyvale home. Vigoda performed with a head-mic and a V-shaped violin attached to her neck, which allow her hands the freedom to both bow the violin and occasionally tap the start/stop buttons on her looping electronics, which she also taps with her feet. How hard can it be? Devilish hard, I imagine, but Vigoda makes it look easy. Though even she had to do the occasional restart to make sure everything was in sync. Hence the "live" in "live looping." Vigoda doesn't just produce interesting electronic music with loops; she uses the technology to enhance and multiply her own voice and violin playing, allowing her to add percussion, harmonized violin and backing vocals all from her own voice and violin. The effect is that of a small band. This is illustrated nicely in the lovely "Thaw," written about her relationship with her mother, which easily morphs into the classic "Irish Lullaby (Tura Lura Lura)." But violin wasn't Vigoda's first choice of instrument. "I originally started playing the piano, like my father. But I wanted to be different so I tried the trumpet," she told me. "But at age eight I lost my front teeth and the orchestra needed violins." Fast forward to the early 2000s, when then-husband Brendan Milburn caught an exhibition in San Diego about Ernest Shackleton's famous 1914 expedition to Antarctica in which Shackleton's heroism ensured the safe return of all 200 of his crew. No strangers to writing musicals ("Sleeping Beauty Wakes," "Toy Story: The Musical" among others) they decided to create a self-contained musical that Vigoda could perform herself, and with the help of playwright Joe DiPietro (Tony award-winning "Memphis") "Ernest Shackleton Loves Me" was born, subsequently changing it into a 2-person performance. "Shackleton" has already been tried out in Seattle in 2014 (with Vigoda and Wade McCollum), the centennial of Shackleton's journey, and moves to New York off-Broadway in the spring of 2017. Valerie Vigoda has a need for live performance, and she commands the stage with her singing, playing, looping and general vitality. At the house concert we were treated to a selection from her new album "Just Getting Good" in which she mixes her own compositions with old standards like "Hard Times Won't Come Again No More" and new versions of more familiar songs like Annie Lennox's "Little Bird," the Beatles' "Blackbird" and Elton John's "Rocket Man." Jimmy Page occasionally played his guitar like a violin, but Vigoda sometimes makes her violin sound like a rock guitar. She's a captivating performer, with a lively and unique sound. 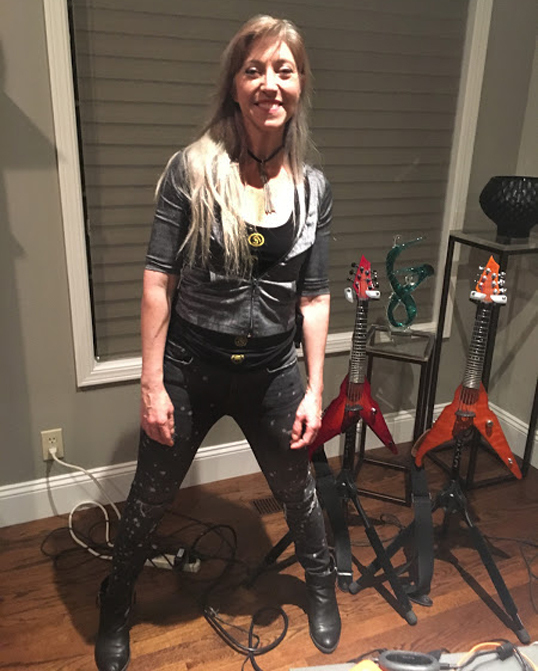 Valerie Vigoda at the home of Kevin Surace and Erica Rogers in Sunnyvale, where she performed a solo show on Dec 2, 2016.